It should be noted that Ctrl+L did an insert of a picture in Wave 3 but that has been replaced with Ctrl+J. Update: It looks like I made this post over the post that contained the list for the Beta. Oh well. No one should be using the beta build now. Those that took a look at my “About Me” page know that I worked on Office products for a long time before moving over the Windows Live division. I saw the days when we would take the Office applications and place them together to truly make sure we had the same menus and toolbars in alignment pixel by pixel. This lead next to shared code across the Office suite with Office ‘95 and the introduction of “command bars”. Later on Office finally received “The Ribbon” with Office 2007. Personally I was really happy to see the ribbon add to Office. Having working on areas of Excel like charting and pivot tables there were just too many features that were buried or hidden that the power that was in the product was just on being discovered by users. 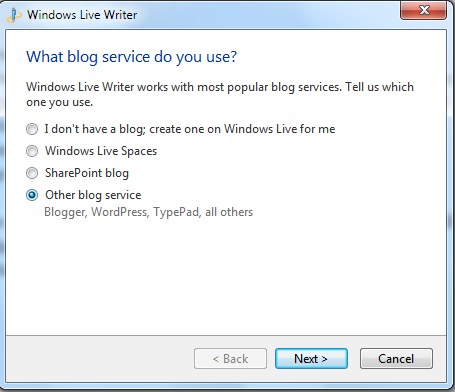 Of all of the Windows Live applications in my mind the application that can most benefit from the ribbon is Windows Live Writer. Many features are buried and as an example a few months back many of the tweets about Live Writer were that it had watermarks for images. This feature has been in Writer for many years now but was buried under the Advanced tab for images. Why would you think that you needed to into Advance to add a watermark to an image? With the ribbon it is right there for you to use as a top level action on the Picture Tools Tab. For this post I want to start by talking about the Home tab of the ribbon for Live Writer. But first I should make a few comments about the ribbon itself. The whole Live Essentials suite is sharing the same ribbon code. In fact this code is the same code you see in the applications in Windows 7 that have the ribbon like Paint, WordPad, the Calculator, etc. This is not the same ribbon code that you find in Office applications. As such one of the things you will find in Wave 4 applications is that the ribbon is not extensible for plug-in developers. In Wave 4 the sidebar remains for developers to use and if you were doing things to customize the menus there is a place where your customizations will live but unfortunately you will not be able add your own buttons to say the Home Tab. The picture above shows the Home tab as it appears in the Beta build. As you can see the Home tab looks a lot like what you would see in Microsoft Word and really the whole Office suite. On the left hand side you have the standard Clipboard buttons for Cut, Copy, and Paste. The Paste button will drop down to allow you to do Paste Special. Next are the common Writer buttons for publishing. There is a big button to Publish your blog post. 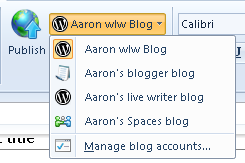 There is also a button to add a blog account which takes you through the same configuration wizard that we had in the previous version of Writer. The last button in this group which is the top on the right is a drop down button that lists all of your blogs you have configured along with an option to manage your blog accounts. If the blog server is using a Writer manifest file on the server where they have included an icon for the blog you will see it next to the blog name. In the list below you can see icons for my Spaces blog and WordPress blogs with icons. The next part of the ribbon is the Font controls. You can select the Font family and size. The button next to those is the clear formatting button which will clear any and all font formatting that had been applied. Below that is bold, italic, underline, and strikethrough which were available on the toolbar in Wave 3. New to Wave 4 are subscript and superscript buttons. Also new is text highlight color and like Wave 3 there is font color. Since the font color button is a drop down now it is faster as a user than Wave 3 to pick a color. The next set is the Paragraph controls. This is the same as in Wave 3. You can select from bullet or numbered lists. There is a button for block quotes. There is also the paragraph alignment controls for left, center, right, and justified. Not show in the picture above but part of the product is paragraph direction controls so that if you have your blog set to write to a right to left language like Hebrew or Arabic you can set the input direction at the paragraph level. With the ribbon one new thing we could do was to show you the HTML styles as they were defined in your blog theme assuming you had selected to detect it. In the picture of the home tab it is for a fairly generic them. In the pictures below you will see a couple of other themes where fonts are different and there might be colored fonts or backgrounds. I should note that we added in keyboard support that matches Word’s keystrokes for switching styles which is something that did not exist in Wave 3. I should also note that the picture below show the gallery expanded. The next ribbon set is the common things you will insert into a blog. We have a whole Insert tab in the ribbon for all of the things you might want to insert but we put Hyperlink, Picture, and Video on the Home tab. As you can see from the picture below for the Home tab the picture button we give you the ability to add pictures or photo albums. Also we added back the ability to insert pictures from the web on Windows 7, something that we lost between Wave 2 and Wave 3. The last section of the ribbon for the Home tab is the Editing section. Here you have spelling, word count, find (sorry no replace), and select all. Word count is another example of a feature that was buried in the old UI but now is really accessible with the ribbon. In my next blog post I will talk about the other main ribbon tabs; Insert and Blog Account along with the new and existing keyboard shortcuts. In later posts I will talk about what is on the application menu and the new Post Properties UI but I wanted to also talk about other parts of the ribbon itself for those that had never used it in a program. 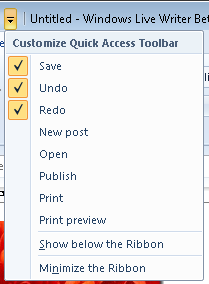 The first is the Quick Access Toolbar (QAT). By default this is above the ribbon tabs and where you can find a Save and Undo/Redo buttons. From the picture below there are other options built in to what you can add there. What you might not know is that you can also add any button from any part of the ribbon to the QAT by just right clicking on it. From either location you can also minimize the ribbon if you want the space for editing your blog post. Click on any ribbon tab will drop the ribbon down and you can select the button you want. You can also minimize the ribbon by double clicking on a ribbon tab. You can also move the QAT below the ribbon and above the Post Properties area if you want it closer to the ribbon. Lastly the ribbon itself is fully keyboard accessible so you do not need to use the mouse at all. If you hold down the Alt key you will see shortcuts appear on the ribbon as you enter the associated character(s) you can navigate to the button you want to use. As I wrote above this is the first of a few posts on the beta for Live Writer Wave 4. Please leave me comments so I know people are reading these posts. Writing is not more forte so I do not know if I am writing too little or too much. I hope you will enjoy the beta which will be out “soon”. PS. This post was written with the Wave 4 beta build of Live Writer. Update: I forgot to mention that you can also minimize the Ribbon with via the keyboard with Ctrl+F1. We love our plug-in developers. Every week there is something cool or new that shows up in the Gallery. What is more amazing is that is is done with documentation that is not so great. 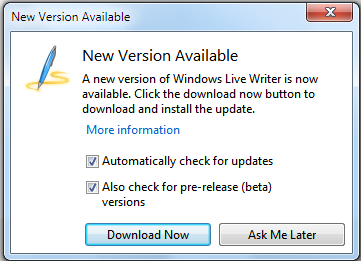 I wish I could say that we are moving at a faster pace at updating the Live Writer SDK but this has not been the case. One thing that was pointed out this week was that our SDK is wrong for where it is suggested you register your plug-in when you writer your installer. When you submit your plug-in to the Gallery we will catch this mistake but you can save yourself a re-submit but making sure you write the key to the correct location in the registry. I will try and remember to update this post when a new version of the SDK is published with this correction. If Windows Live Writer crashes for you when you try and insert a hyperlink via the Insert menu or Ctrl+K or if Live Writer crashes when you try and bring up the Tools/Options dialog or Tools/Accounts dialog here is a solution for you. Live Writer has a great feature in that you can auto link a URL so that if you type a specific phrase it will automatically hyperlink the phrase for you. 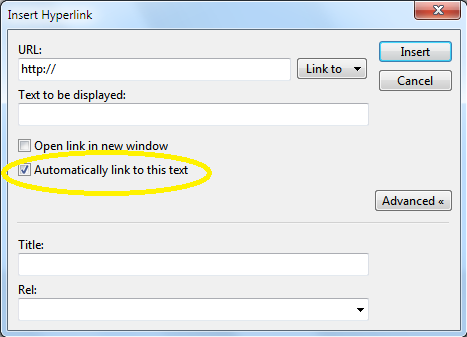 You can set this up in the Hyperlink dialog by checking “Automatically link to text” or by editing your list in the Auto Linking option. This list is stored in Link Glossary file which unfortunately can become corrupt. You need to navigate you the folder that contains linkglossary.xml. The quickest way is to from the Start menu select Run and then enter “%appdata%\Windows Live Writer\LinkGlossary” without the quotes. If you have a bunch of entries for Auto Link you can try and copy the contents of your old xml file into the new xml file but if you crash again the chances are you copied over a corrupt entry. Thanks to help from the product support team we are really confident that we have fixed this problem for Wave 4 users and that you should start to see this in the Beta. The corrupt file should not crash Writer and in some cases we can recover the list for you. What is in the Live Writer Wave 3 update? If you clicked “Download Now” you were taken to the standard suite download page but what the page does a poor job of is letting you know what build you will be installing. The build of Writer is 14.0.8117.416. In previous updates for Wave 3 the chances were that you got the update to Writer when you were prompted and or forced to upgrade Live Messenger. These upgrades by default upgrade the whole Live Essentials suite. The other way you could have upgraded is of course through the optional install on Microsoft Update. A few people have complained that they did not want the whole suite, only Writer. If you had not installed the whole suite before setup does try to only update the installed components. Chances are that if you had Live Essentials installed on your new computer when you got it you did have more than Writer and you should take updates to those programs also on the off chance you go to use them some day. If you have not tried Photo Gallery there are some nice features in it. I should say that a hope for Wave 4 is that setup does a better job of only updating installed programs and not try and add programs once you have done an initial custom install. So the question that many people have been asking is what is new? Where is the change list? The simple answer is that is all underneath the covers. Quality improvements have been made and your user experience should be better for installing the new version. If you are looking for new big features you should stop looking. There are not any. In fact we even clean things up a bit. I have not seen any tweets or blog posts about this even by those that have written about the latest update but we cleaned up the menus a bit. Drop down your Help menu and see if you can remember what was there before versus. what is there now. In general I am not sure if people notice when UI tweaks are made to Writer. While very minor for the first Writer update we re-branded the Maps feature (Insert/Maps) to be Bing maps from, I think, Live maps, MSN maps, or maybe MapPoint, and no one ever made a comment about that. In the end, installing this update should only make things better. To date we have seen a few people tweet or make comments that something broke or things were worse after the install. When we have followed up, what was said in 140 characters, was not really a new problem or even a problem at all. Lastly as has been written about and was even referenced in post about the suite update there is a strong chance that is will be the last update for those running on Windows XP. Wave 4 will not run on XP. If you do run on XP you really should install the update so that you stay as stable as possible. While you can find many posts out on the Internet about how to set up Windows Live Writer with WordPress there does not seem to be many, if any, on how to set it up with TypePad. Perhaps because you really do not have to jump through any hoops to set it up but I thought I would write up a quick post on how to set it up anyway. TypePad has been around since 2003 and was created by Six Apart Ltd. It is based on their Moveable Type platform and Moveable Type is another blog server that Live Writer supports. If you would like to blog on TypePad you need to go and set up your account. Currently they have a free trial which converts to a paid service in the US. You will need to know your blog URL to configure and work with Live Writer. If you do not know your blog URL it can be found in your Dashboard settings. Log into your TypePad account using your email address and TypePad password. Next click on Dashboard and then Settings under the area called Manage My Blog. Here you will see the URL for your blog in the Blog folder section. Unless you host your own domain it will be something like http://<your blog name>.typepad.com. For example of your blog was called “Trip Reports” you would see http://tripreports.typepad.com. Once you know blog URL you can launch Live Writer. If this is the first time you have used Writer you will see the wizard that will take you through the blog configuration. If you have already configured Writer to work with another blog then you can start the wizard by selecting Add blog account under the Blogs menu. On this first step of the wizard select “Other blog service”. 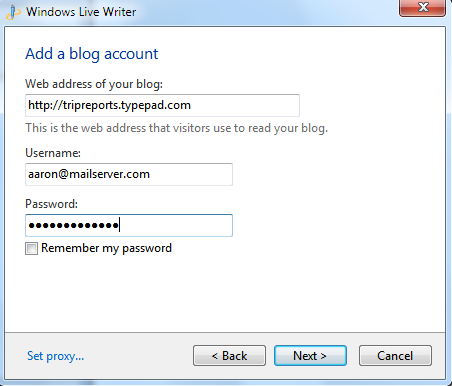 Enter your blog URL and the username (email address) and password you use to login into the TypePad website. If you know you need to manually set your proxy server you can click on the Set proxy link. Chances are you do not and you can just click Next. At this point you will be asked if you would like to have your blog theme detected. Live Writer supports the ability to show you what your post will look like while you edit it if you do have your theme detected so I would suggest you say Yes. Regardless of how you answer you will now be on the last setup of the wizard. Here you can give your blog a friendly name that is used only in Writer and you can also associate your blog with your What’s New feed in Windows Live if you have a Windows Live id. 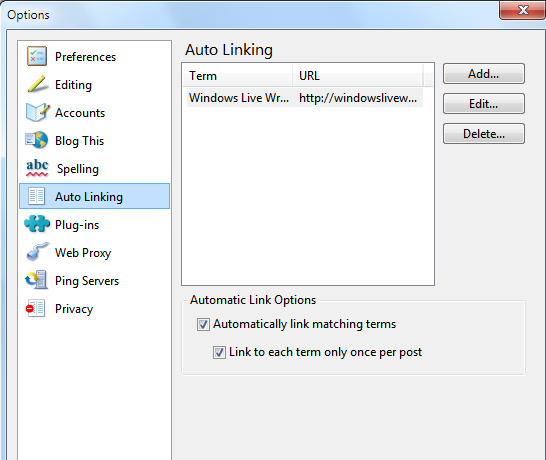 This will allow your Windows Live friends to know when you make new blog posts. This is by far my favorite feature that just works in Live Writer and you might not even think about. The feature is when you type or paste URLs from many different sites that point to a video Live Writer just converts the URL to the embedded video. For example “http://www.youtube.com/watch?v=PdTWf8oWjdg” is the URL to video that I took on my cell phone of Mike McCready of the band Pearl Jam playing the US national anthem at a Seattle Mariners game. When you type or paste the URL into Live Writer it will just convert it to the video itself since Live Writer knows about the format of the URL for YouTube. Try it out with any URL on YouTube or your favorite video hosting site and see if it works. Add a comment if it does not work for your favorite video hosting site and we can see if we can add it to the list. Today Jason Zanders had a blog post about the Visual Studio 2010 Productivity Power Tools. Kirill Osenkov took this post a step further and pointed out how you can now copy code has HTML from Visual Studio with this set of power tools which Live Writer will paste without messing up your formatting. There are some great plug-ins for Live Writer that do the same thing but here is an alternative where you do not need a plug-in on the Writer side of things if you are always going to be coping code from Visual Studio and using that as part of your post. Great work from the VS team! One of the things I hope to do with this blog is to make comments about what users are tweeting about for Live Writer. A topic from a few weeks back now was a topic about how to remove an entry from your custom dictionary once you have added it. This is one place where Live Writer does fall short. The Add menu item is there but we do not have the ability like you do in Microsoft Word to edit your list of words you have added. As the post points out this is just a text file that you can edit in any text editor like Notepad. One thing I would note is to make sure you do not leave any gaps in the list and that you only have one word per line. 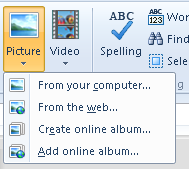 A great idea for a plug-in would be one what lets you first import from Word/Office so you have the same custom dictionary in both Office applications and Live Writer for spell checking and also just lets you edit the list without having to dig down into your application data folder and find the file you need to modify. I’ll add this to my todo list to work on some day. Leave a comment if you beat me to it.